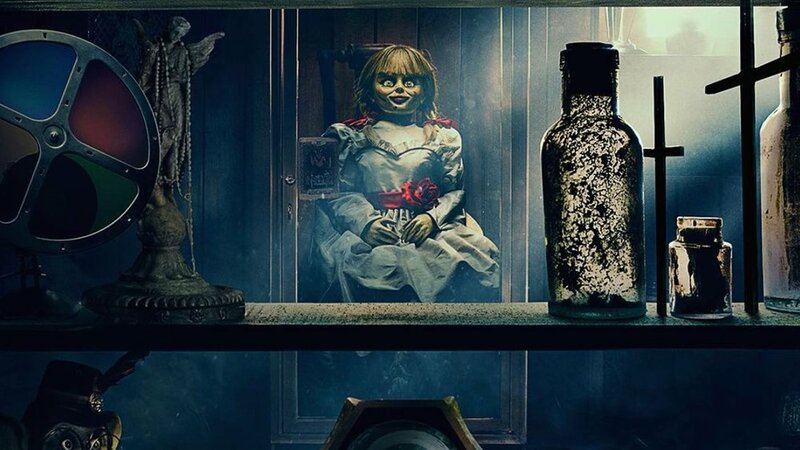 Annabelle: Comes Home producer James Wan has shared the first image from the film and as you can see it features the evil demonic doll sitting in the home of Lorraine and Ed Warren. The doll is one of many haunted artifacts that reside in their home and as you might expect, it wreaks havoc on the Warren’s home. The third installment of the Annabelle franchise picks up with the Warrens bringing Annabelle to their artifacts room where it “awakens the evil within that room and they target the Warrens’ 10-year-old daughter, Judy.” It was also teased that Annabelle basically activates all the other haunted artifacts in that room and things are going to get crazy terrifying. I imagine that some of the artifacts that we see in this image will be the ones that are reactivated and haunt the home like it’s never been haunted before. Patrick Wilson and Vera Farmiga will reprise their roles in the franchise and the will be joined by Captain Marvel and Gifted star Mckenna Grace, who will play Ed and Lorraine Warren’s young daughter Judy. Jumanji: Welcome to the Jungle star Madison Iseman was also cast in the film. She will play a babysitter who will be watching over Judy. Obviously, Annabelle is going to make their lives a living hell. The film will be directed by Gary Dauberman, from a script that he wrote. He will make his directorial debut with the film and Wan is producing. Annabelle 3 will be released on July 3, 2019.